A hope of future for the upcoming enthusiastic intellects just like the cherishing sunrise begins with the heavenly campus of ITM VOCATIONAL UNIVERSITY. A blessing of the god as knowledge along with the excellence of students begins with the university. A workers paradise for the overall development not only in academic section but in all fields with the grace of gurus. A home for the true seeker of knowledge. At ITM Vocational University we remain conscious of the future and ready to build a better tomorrow in an ever-changing world. At each day, here we constantly come across new thoughts and ideas that prompt our own innovative and creative thinking. The memories, perspectives and friendships that we are going to take away from our college are the things we are going to keep for life! ITM VOCATIONAL UNIVERSITY is the place that not only gives perfect direction to apply your magnitude but also provides all the support and guidance you need to pursue your ambition. It has a perfect blend of academics, project based activities and other activities. The method of project based studies helps in development of technical skills, improving management skills and soft skills. “The point is not just about going beyond limits, but also about being LIMITLESS” I think that is the motive of ITM Vocational University. "ITM Vocational University is proud to host “Regional Student Forum” of SPEED India 2016"
Innovating Education and Educating for Innovation An Expert Talk on “The Power of International Collaboration” by Dr. H G Parsa, Professor & Director, Daniels College of Business, University of Denver, USA. 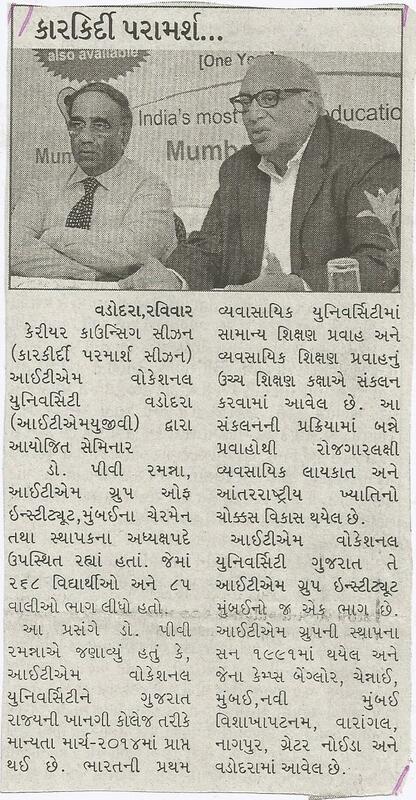 Event Wrap up Report On 9th November 2016, Faculty of Management, Economics & Commerce, ITM Vocational University, Vadodara, organized a power talk session which focused on “Meaning of Life and Purpose of Education” and “The Power of International Collaboration”. Industrial Visit is one of the key parts of the curriculum at ITM Vocational University. 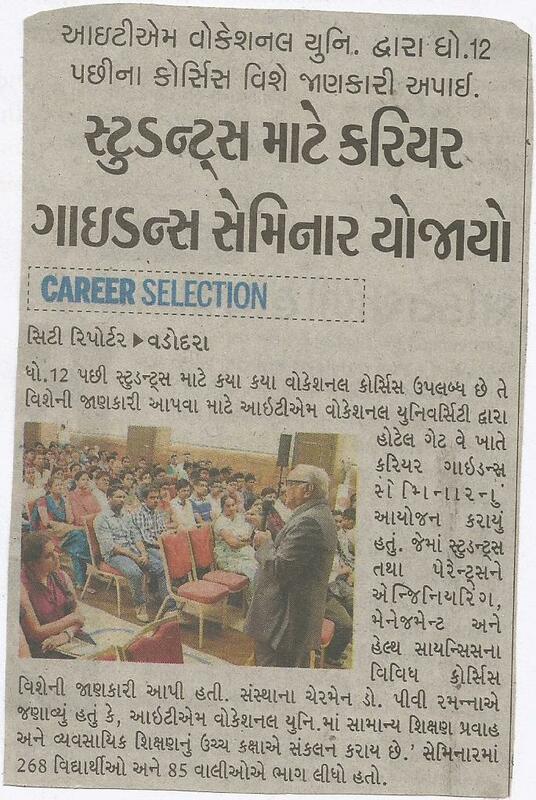 MBA and BBA students of Faculty of Management, Economics & Commerce invited by Divya Bhaskar a leading national newspaper on 25th November 2016 for industrial visit. Innovation in Education Award to Dr K S MURTHY , Provost, ITM Vocational University at Higher Education - Gujarat Chapter, 4th Regional Conference on Nov 19.2016. Dr K S MURTHY, Provost, ITM Vocational University receiving 'Innovation in Education Award ' from the hands of Prof.Parimal Vyas, Vice Chancellor, The M S University. This academic year the management of ITM Vocational University has introduced a tour, as a part of orientation programme, in order to create a sense of belongingness among the freshers. 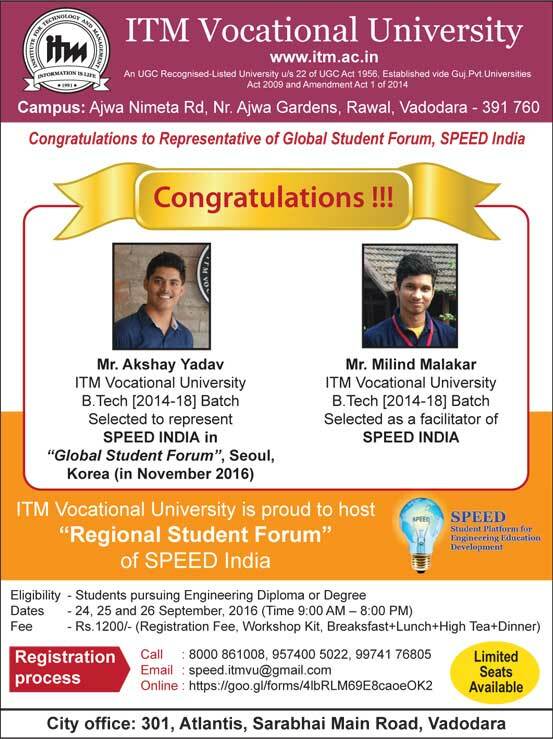 "ITMVU have organized Regional Student Forum (RSF), it’s an international level event supported by SPEED (Student Platform for Engineering Education Development) – India in collaboration with IUCEE (Indo Universal Collaboration for Engineering Education) at ITM Vocational University, Vadodara. 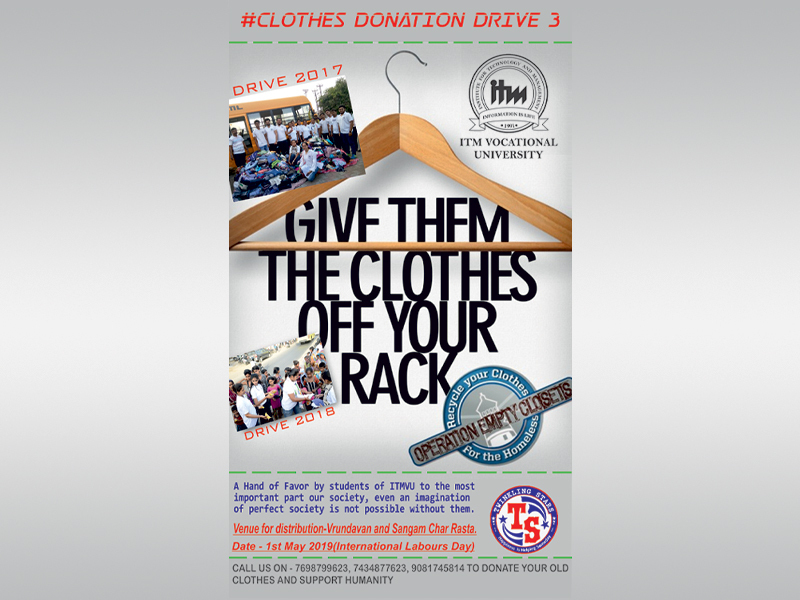 The students of ITM Vocational University organized 5- days ?Shram Dan Campaign? under Swatch Bharat Mission at Sanoli and Juna Rampura village Tq. Waghodia, District Vadodara from Aug. 29 to Sept. 2016. The camp is sponsored by the office of District Rural Development Agency (DRDA), Vadodara. The Taluka Development Officer has assigned the village as per their village level development plan. ITM Vocational University has recently been given permission from Google for conducting the Google?s Applied Computer Science with Android workshop. Welcome and congratulations on your acceptance to the ITM Vocational University. We are delighted that you will be joining the ITMVU family right away. The Orientation Program, on 4 th August 2016, is designed to answer all your queries about the university thereby clearing all your doubts that you might have fostered in yourselves thus far. MAXIMAL" is a group in which people help to mould the future of upcoming generation. In this group ITMVU’s students teach the other students as well as aware them about the topics like career selection, leadership, teamwork, what are the benefits of this, how it will be helpful to them in future and we include activities like quiz for improvement of general knowledge, tower making to see the teamwork and strength and debate to increase their confidence. Welcome ROBOT Considering "Make in India" & “Skill India” concept, govern by our Honorable PM Shri Narendra Modi, our ITMVU students have made a robot who welcomes everybody by joining of hands. It is made from wooden sheet and metal stand. Microcontroller control the speed of the Motor which is responsible to lift the heavy weight hand. ITM vocational University’s students having 1 month training at Tata Power Skill Development Institute, Shahad, Kalyan center to provide them an insight and experience with the requirements and technology in the Power Sector, together an intensive training program covering the gamut of areas in the power sector - Generation, Transmission, Distribution. Also they have included essential equipment like switchgear, transformers and substations. 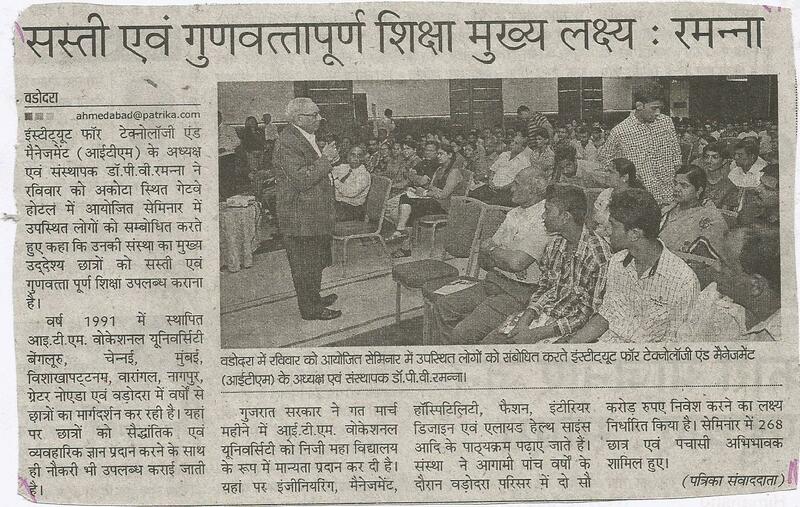 Importantly providing students an overview of Solar Power which is being pushed in a big way in India. As a part of Indian festival celebration Students and Faculties of ITM Vocational University celebrate Diwali in innovative way. 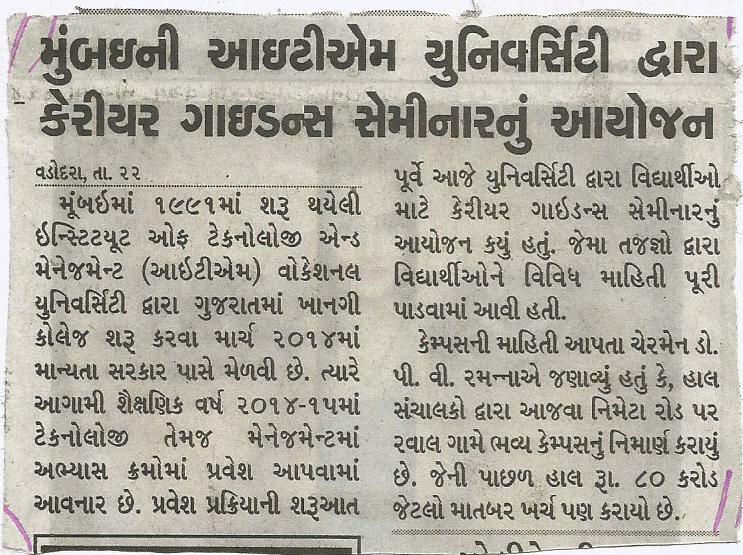 All the students and faculties have arranged to visit nearby villages of ITMVU on dated 17/10/2014. ITM Vocational University, Vadodara, Gujarat.